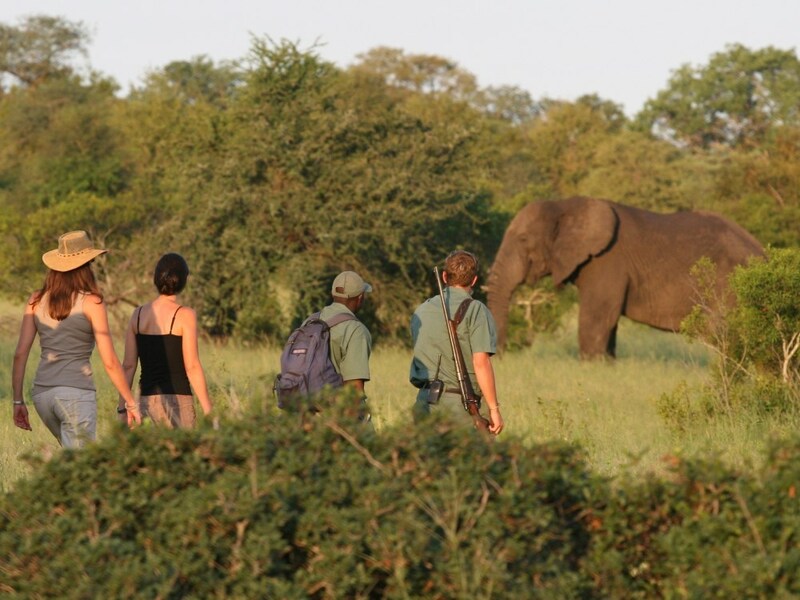 A uniquely rewarding bush experience - nothing beats the thrill of encountering big game on foot! to be in an excellent prime Big Five game viewing area is one thing – to then tackle it on foot out of the comfort zone of a Land Rover makes it a much more intense, heart pumping experience altogether! Rhino Walking Safaris lie within a private concession in the world-renowned Kruger Park just north of Skukuza and so offers a wildlife experience second to none. 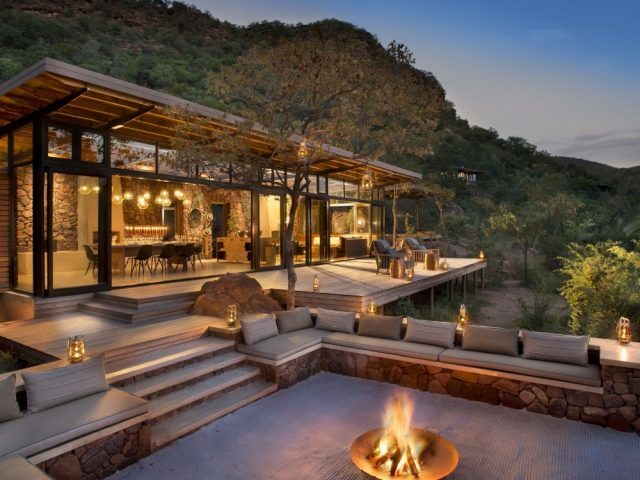 To give you some idea of how prime this area is, the concession shares an unfenced boundary with the famous Mala Mala and Sabi Sand reserve with an abundance of wildlife moving freely between the two. To be in an excellent prime Big Five game viewing area is one thing – to then tackle it on foot out of the comfort zone of a Land Rover makes it a much more intense, heart pumping experience altogether! Rhino Walking Safaris specialise in exclusive walking safaris through 12 000 hectares of pristine bushveld where you will follow animal trails on foot. 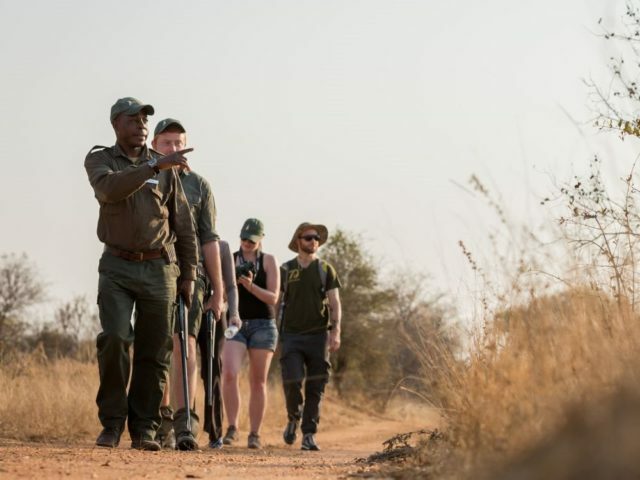 The bush walks are all accompanied by two highly qualified and armed rangers who understand animal behaviour and territorial boundaries and will share their wealth of bush knowledge with you – from the animals, trees, grasses, insects and birds you might see to the medicinal uses of plants, basic tracking and survival skills. Nothing is predictable in the bush, therefore each walk offers a potentially new experience which will open your eyes, nose and ears, making your heart thump a hundred beats a minutes. You are not guaranteed to see any game but you know they are there (probably watching you in fact!) as you see signs, perhaps a fresh leopard track, the warning bark of a secretive bushbuck, or the unmistakable scent of a passing elephant herd.But don't fear as these animals would rather carry on their daily life than worry about you - much less attack you! But you might have an opportunity to encounter many of the classical African game such as herds of impala, walk next to stately giraffe or come across a crash of rhinos (perhaps even the more toothy members of the Big Five!) This truly is a way to feel much more at one with the bush and really feel alive! Rhino Walking Safaris operates from Plains Tented Camp which only caters for a maximum of eight people (no children under 12), so you are ensured of a quality, pristine wilderness away from the crowds! There are 4 luxury, comfortably furnished African explorer-style tents with en-suite bathrooms (hot water) and whilst simple they offer all the necessary comforts whilst avoiding unnecessary luxury - all linen is 100% cotton percale, there are gorgeous down duvets and furnishings of a very high quality, including numerous antiques and a variety of guest amenities are provided. 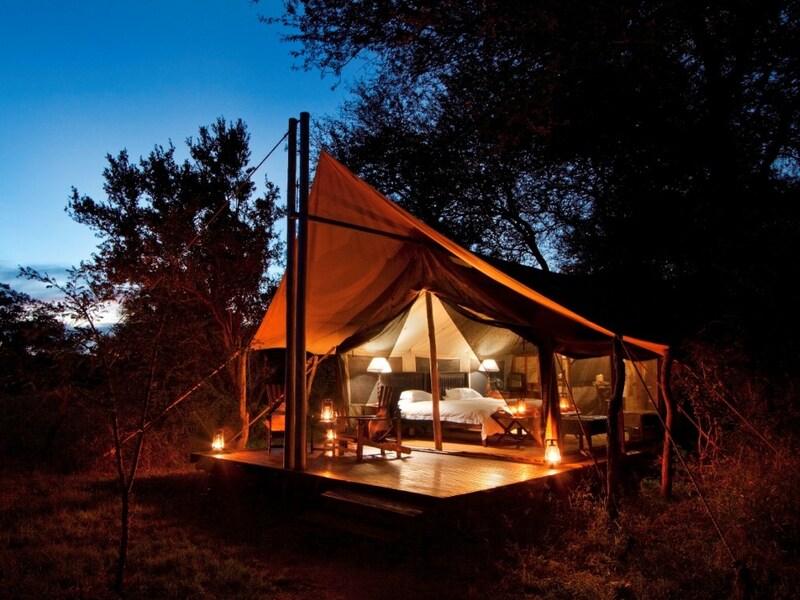 The tents are set an acacia knobthorn thicket which overlooks the spectacular Timbitene plain and an active waterhole so you can enjoy game viewing right on your doorstep. Built in authentic pioneer tradition, it creates the ambience of a 19th century naturalist’s retreat - take in an Africana book collection and antique treasures reminiscent of a golden bygone era. The lodge’s tents and public areas are raised on wooden decks – the tents are constructed purely from canvas and wood, with no trees having been chopped down in keeping with operating company Isibindi Africa’s ethic of “treading lightly on the land”. This camp is specifically designed for low energy consumption and makes use of a generator and a back-up battery system, which power overhead fans and 24 hour lighting (also used to re-charge camera batteries). The communal area includes a lounge and dining area with an outside fireplace for cold evenings and small plunge pool – perfect for chilling those sore muscles after a long walk! A typical day at Plains Camp begins with a mug of steaming coffee (or tea) and traditional homemade rusks, after which you set out on your morning walk - following rhino tracks and elephant paths! Trails are structured by the rangers taking into consideration the fitness levels of the group (usually 3-4 hours in length) and avoid the heat of midday. After a delicious brunch, afternoons are spent enjoying and relaxing in the cool of the acacia trees, keeping an eye on the waterhole where a stream of animals coming to drink will keep you enthralled. After the heat of the middle of the day is passed, you will set out again in the late afternoon to explore again on foot or take a game drive. Dining is an elegant affair in keeping with the nostalgic ambiance with your table set with crisp linen and silver - food is all homecooked, fresh and delicious! We find that the walking camp makes a great combo with its more conventionally luxurious sister camp, Rhino Post, which is centred around vehicle based game drives. So you could for example spend a couple of nights at Rhino Post before moving across to the Plains Camp for the walking experience – this way you get to enjoy 2 completely different experiences. Talking of different experiences, another stunning option (at extra cost) is to spend an unforgettable night out under the stars at the concession’s Sleep-Out camp - sleeping outdoors, under the stars on elevated wooden platforms 4 metres high. You will arrive on foot and after hanging up your mosquito net and preparing your bed on the platforms which overlook a waterhole, you can relax and enjoy the sunset. 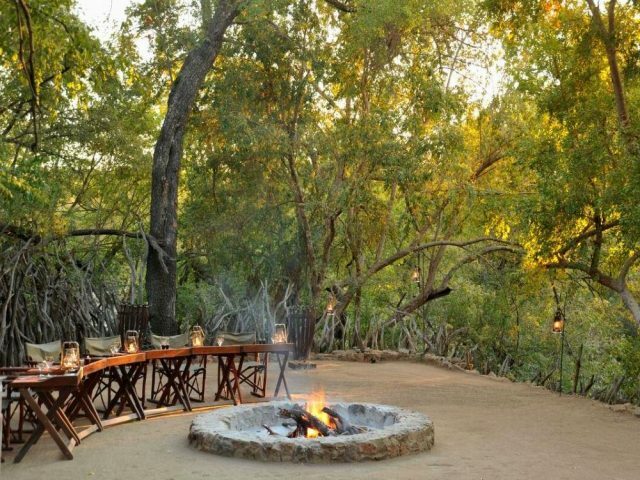 As the night settles you can appreciate the sounds and other senses of the African bush, whilst sipping a refreshing sundowner, while your guide prepares a braai on an open blazing fire. Then it’s time to retire to your individual platform where you may be serenaded to sleep by the whooping of a hyena or the roar of a distant (or perhaps not so distant!) lion!